Top and bottom left image courtesy calhomebuilders.com. Bottom right courtesy Bing Maps. 11 single family one and two story dwellings with 2 car garages. 32 single family two story dwellings with 2 car garages. 47 two story dwellings with 2 car garages. Various single family dwellings may include 3 car garages. 30,000 cubic yards of soil will be hauled away. Overall, the homes will vary from 1,485 sqft and 3,500 sqft with 4 - 5 bedrooms and 3 - 4 baths. The location is 8500 Fallbrook Ave Canoga Park 91304 which was formerly the longtime home of the Boeing Fitness Center which became the Pratt & Whitney Fitness center after they acquired the Rocketdyne division. 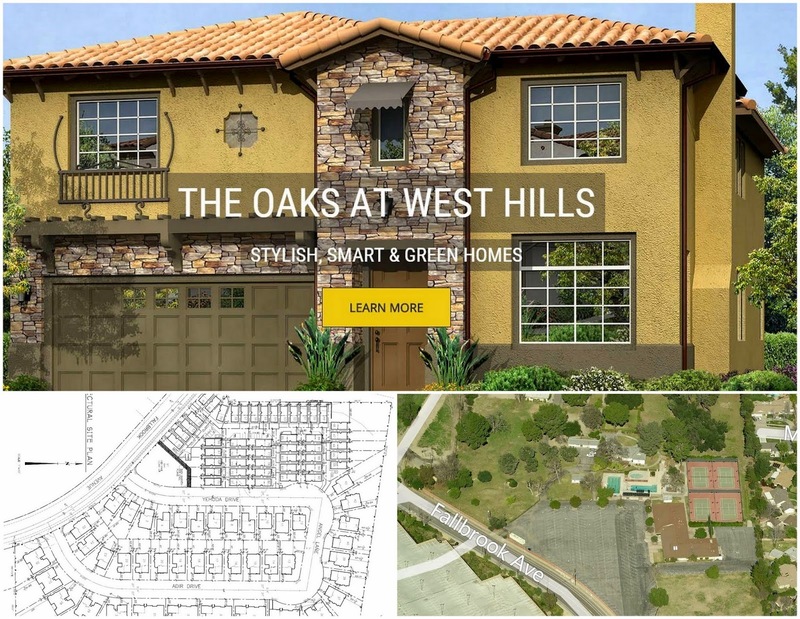 The new project is called The Oaks at West Hills by California Home Builders which now has a website up to inquire about the development. The property measures 13.7 acres with 13,194 sqft of building space built in 1963. 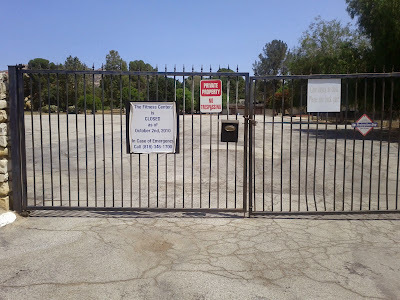 The property was recently sold on May 23, 2013 for $9,500,000 from Boeing North American Fitness Inc to The Village at the Valley Condos Inc which is owned by California Home Builders based at 21510 Roscoe Blvd Canoga Park CA. 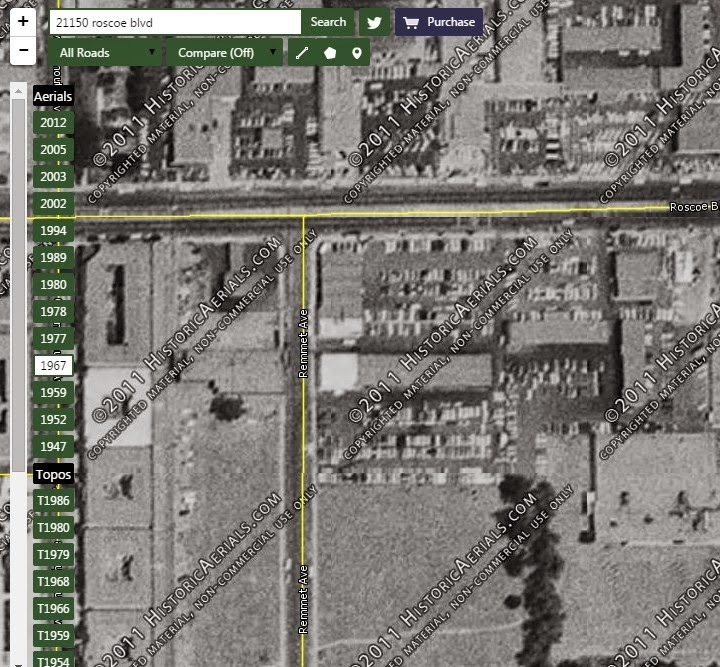 On a separate note, the Cal Home Builders office at 21510 Roscoe (not the fitness center) has historical significance as the former ranch home of Albert Lawrence ("A.L.") 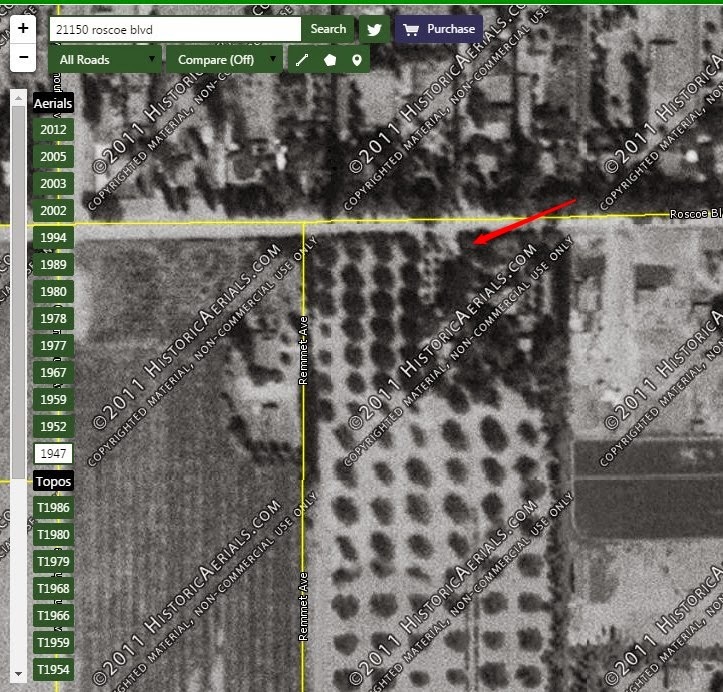 Schoenborn (see image below) during the 1920's who purchased and subdivided a number of Chatsworth area tract homes. Schoenborn was known as the founder of "North Owensmouth" but is better known today as a street name that runs across the SFV (Paradise Leased). I also remember this location as being a former Jeep car dealership when Roscoe Blvd was thriving with dealerships. Image courtesy Historicaerials.com showing 1967 Canoga Park with ranch demolished and dearlership in place. Going back to the Boeing Fitness Center, this location was used by Rocketdyne employees and family for various recreation activities and events which contains 4 tennis courts, 3 swimming pools, 2 sand volleyball courts, fitness center, an auditorium with capacity for 225 persons, and large areas of open land which is home to the Aerospace Retirees club, Local UAW union meetings, and fitness classes for seniors. The multiple acre park is a historic landmark for this community that was bought from the original estate landowner in 1959 (see image below). As of October 2, 2010, the site was closed when discussions about development started to creep but nothing was planned. One random note, this site was recently used for the filming location of TV show Last Man on Earth according to 90210 Locations. 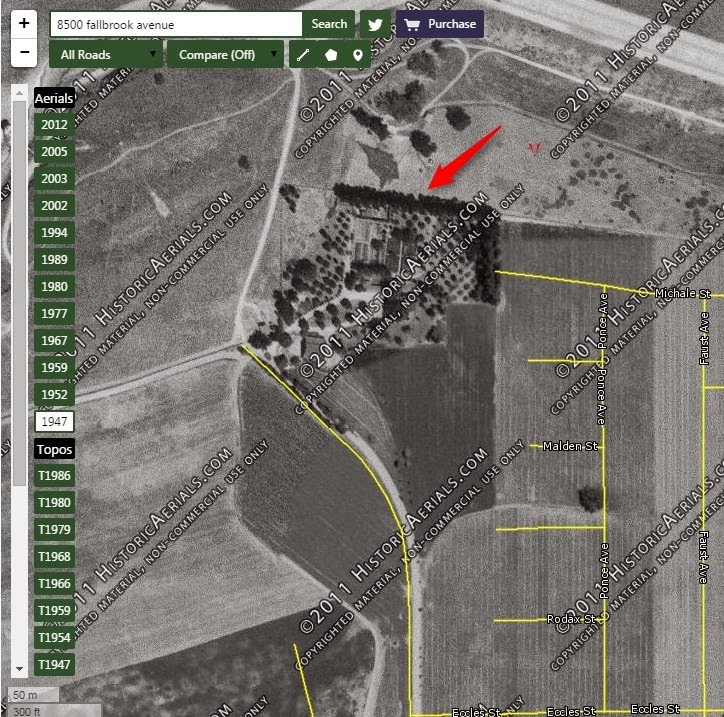 Image courtesy Historicaerials.com showing 1947 Canoga Park or original ranch landowner just south of the Chatsworth Reservoir. I personally have not had the opportunity to visit the facility but I spent countless days passing by with curiosity as a teenager on my bike and later in my car as an adult. 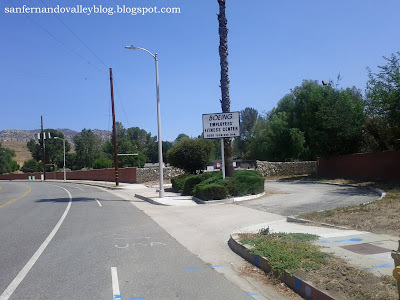 My last visit was after a bus tour of the Rocketdyne Santa Susana Field Laboratory on June 29, 2013 when something on the tour caught my eye that prompted me to visit. 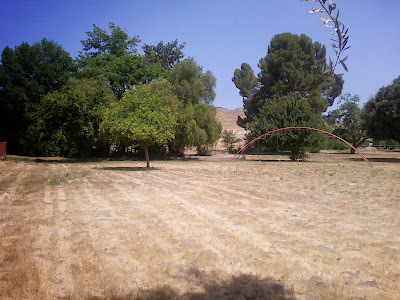 During that tour, I noticed a Rocket ship monkey bar laying on the ground of an open area of the Santa Susana Field Lab. I quickly asked myself, "was that the Rocket ship from the Boeing fitness center?" (During the tour, I wasnt allowed to take pictures although I heard now you can). So after the tour, I quickly drove to the Boeing fitness center and noticed that the Rocket ship was missing which confirmed my initial thoughts. 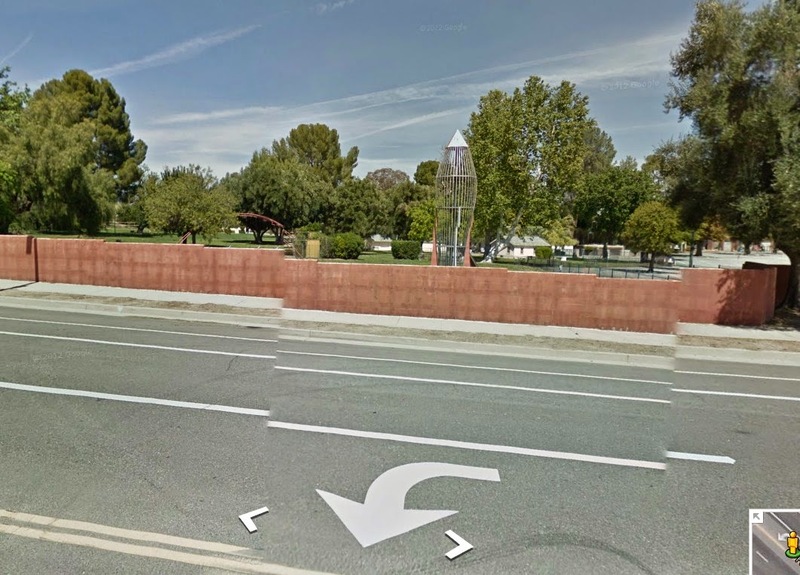 I later went home and checked Google street images which showed the Rocket ship (see below). This might not be a big deal to others but something I always admired and thought was cool. I hope they saved it but I doubt it. [Update May 18, 2015]: I learned during my hike tour of SSFL that the rocket ship will in fact be saved and used at SSFL when converted to a park. You can see a picture of the rocket ship lying down at SSFL here (need to scroll through the pics to find it). The Boeing Fitness Center represented the might of American manufacturing and aerospace prowess. One of the few companies (if not the only) to provide a 13.7 acre recreation facility in the SFV for hard working employees and their families to enjoy during a time when cold war era tensions were high and the only thing that mattered was landing on the moon and beating the Russians. Its a sad day to see a symbol of corporate generosity and employee appreciation go the way of bulldozers. But like everything else these days, change is inevitable, and the once mighty aerospace industry is a fraction of what it was during its hey days. You can view more SFV Architecture and R.E. here. 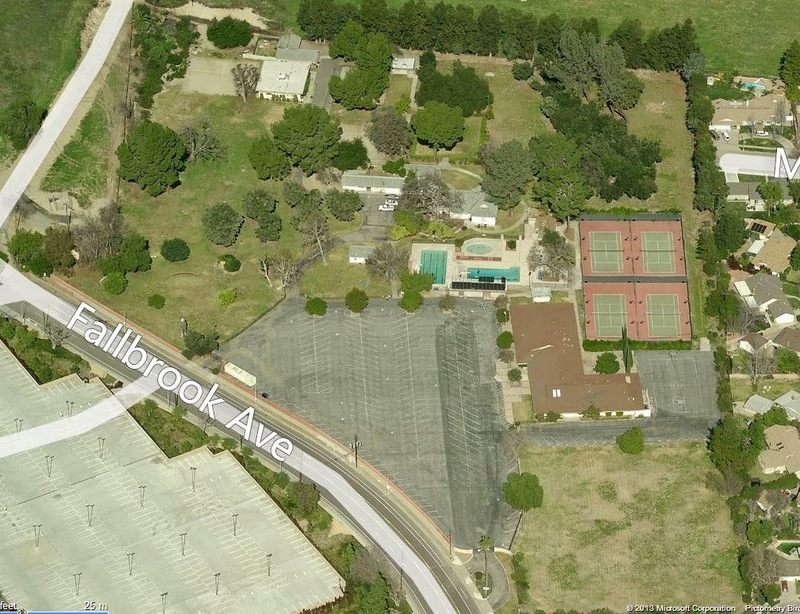 9 comments to ''90 Single Family Homes Coming to Former Rocketdyne Fitness Center in Canoga Park/West Hills"
I used to work at the Rocketdyne facility and used the rec center. I was in a play directed by Milton Parsons (the character actor) called the Tender Trap. It was a great place and a great benefit to the employees and their families. Not only did I play at the rec center, my children also went to summer camp there. I owned a home right behind it for 24 years.....The rec center was a place of fun and adventure. I'm sad to see it replaced with homes no one will buy!!!!!!! St. John Methodist Church was on 20600 Roscoe Blvd is gone for same reason above. When I 1st saw it I thought it looked strange till I was told by Harold Kusuhara eng'r at Rocketdyne, that it was supposted to be Noah's Arc. They had an Archery rang we used, adult trailer club would also use it and had our kids take swimming lessons from life guard. We used the swimming pool a lot! I stumbled upon this article while searching for what became of the Rocketdyne Rec center. I was NA Rockwell/Boeing employee from 96-05 right before the division was sold to PW. Probably saw the final glory days and rapid decline of that Division. I remember company picnics there in the early days of my career. They also held engineering training classes at the farmhouse. It was such a relaxing environment for classes. They had a nice gym, basketball, tennis court, and a nice lawn for jogging. But noticeably less and less people used it over the years. I also liked the rocket shaped monkey bar. I'm glad they are saving it. Thanks for posting this article.